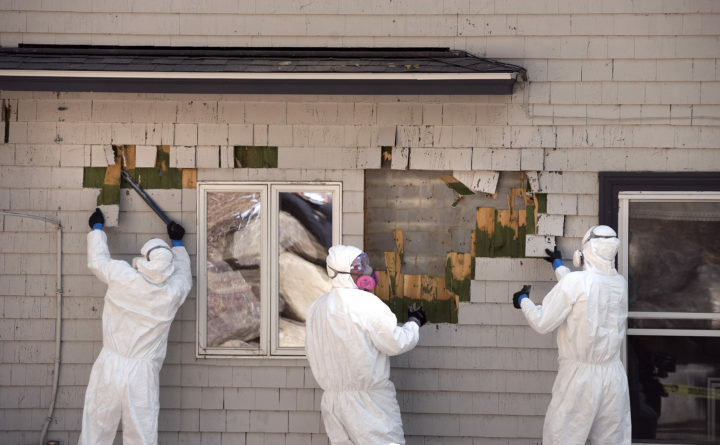 Workers remove cedar shingles, coated with lead-based paint from Jon and Briar Fishman’s camp in Northport. It is never safe for children to have any level of lead in their blood. Lead poisoning can result in a decreased IQ, decreased bone and muscle growth, damaged hearing, and problems with the nervous system and kidneys. It is not possible to reverse these health consequences. But it is possible to prevent them. That’s why it’s important for landlords in Bangor and around the state to know about a new program that rolled out Nov. 1. Property owners can now apply to the Maine State Housing Authority for funding to help remove lead in their rental units. Property owners have to provide matching funds, and they must agree to keep their rental units affordable for at least four years following the lead removal. The lead abatement program is possible because Democrats and Republicans alike in the Maine Legislature made the issue a priority and backed it up with money: $4 million. This is a much-needed initiative. With some upfront cost — lead removal can top $10,000 — the state can reduce the number of children, most often low-income children, who would have suffered life-long debilitating effects. From September 2017 to September 2018, 322 children statewide were found to have been poisoned with lead, according to the Maine Center for Disease Control and Prevention. More have likely been unknowingly harmed. In 2016, the state adopted a new standard for lead exposure. This accounts for a higher number of children found to be poisoned, according to the Maine Affordable Housing Coalition. With the new abatement program, there is one less excuse for people renting to families with children to not fix the hazard hiding in their properties. Lead and lead compounds may be found in paint, ceramics, pipes, plumbing materials and other products found around the home. Children are particularly vulnerable because their growing bodies absorb more lead than adults do, and their brains are more sensitive to lead’s effects, according to the U.S. Environmental Protection Agency. Young children are also more likely to get contaminated dust or soil on their hands and then put them in their mouths. Dishes or glasses may contain lead, or children can breath in lead dust from lead-based paint or soil contaminated with lead. Some toys can also contain lead paint. Exposure to lead increases the risk of developmental disabilities, which can increase the costs of education for Maine taxpayers. The program can also be an incentive to encourage developers to rehabilitate older housing. Concerns about lead hazards sometimes cause landlords and developers to skip over buildings that could be renovated and rented as affordable housing. This can be part of the solution to the affordable housing crunch in Bangor and other cities. You can also test your own home with a free lead dust test. It takes about 10 minutes to do, and you can get the results in about two weeks. You can learn more and request a test kit from the Maine CDC. With new options available to them to, we hope that Maine homeowners and landlords can banish this health menace.